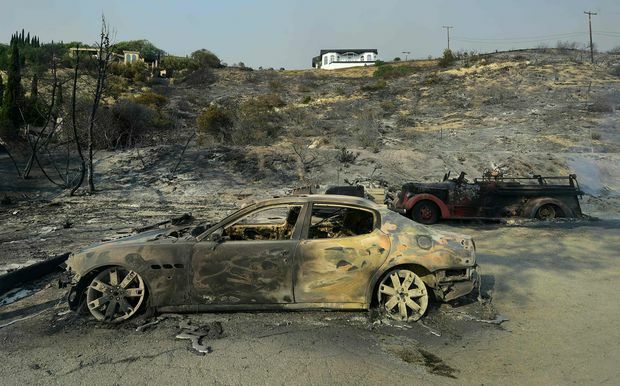 A home remains intact on a hillside above burnt out cars on the Pacific Coast Highway in Malibu, California, on November 10, 2018, as the fight against the Woolsey Fire continues. Rex Stewart was broke when he landed in Paradise, California, more than 40 years ago. But he found work as a carpenter, helping build parts of this mostly modest town of retirees and commuters tucked away in the Sierra Nevada foothills. On Saturday, after escaping what is now the most destructive and one of the deadliest fires in California history, he stood outside an evacuation shelter with no more to his name than the coat he had on and a winter cap with a peace symbol on it. Fires continue to rage on both ends of California, spreading with breakneck speed and displacing hundreds of thousands of people in a state where a once-seasonal worry has become a near-constant terror. At least 23 are dead in the Camp Fire, about 100 miles north of Sacramento, and two others have died in fires near Los Angeles. With the discovery of 14 more bodies Saturday, the Camp Fire surpassed the death toll in last year’s Tubbs Fire, which killed 22 people and was the third-deadliest fire in the state’s history until now. The deadliest, the Griffith Park fire in 1933, killed 29 people. Many people in the area affected by the Camp Fire remained unaccounted for, and Sheriff Kory Honea of Butte County said on Saturday night that officials were expanding the team of people tasked with searching for bodies. Wildfires are fickle pillagers, pivoting to spare one thing and destroy another, twisted by wind and the fuels they feed on. Fire prevention authorities routinely drum the words “perimeter defense” into residents’ minds in this part of California. Keep trees trimmed and burnable things far from home, and fire’s danger diminishes. Horses are tied to lifeguard booths on the beach in Malibu, Calif., Saturday, Nov. 10, 2018. Wildfires are burning in both Southern and Northern California. But the fires that erupted this past week did not follow those rules. And Paradise, in Butte County just east of the city of Chico, bore the brunt of the devastation. In what fire officials said was an unstoppable storm-front fire, beginning early Thursday, the Camp Fire has exploded across 105,000 acres and destroyed more than 6,700 homes and commercial buildings. Paradise, home to about 26,000 people, was shrouded in smoke Saturday. Flames still licked downed power poles, and ghostly chimneys jutted up from charred concrete foundations. Evidence of the chaos of escape lined the road out of town, in the charred frames of cars and trucks that were abandoned midescape. Some cars had crashed into one another as flames roared on both sides of the road. At least seven people died in their vehicles, overcome by the inferno, authorities said. 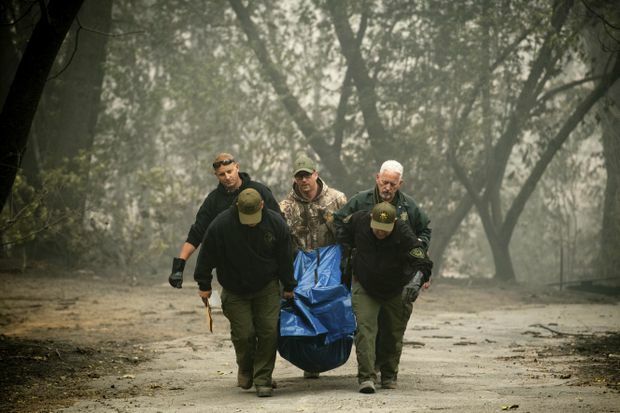 Sheriff's deputies recover the remains of a victim of the Camp Fire on Saturday, Nov. 10, 2018, in Paradise, Calif.
Jackie Gayle, 73, was riding down out of Paradise as vehicles were burning. At Adventist Health Feather River hospital, which Stewart said he had helped build, a helicopter pad was filled with the remainders of a recent evacuation. Wheelchairs and beds, lab equipment and saline bags still hanging on their hooks sat jammed on the concrete pad, which was surrounded by a moat of rocks to keep the flames at bay. Portions of the hospital escaped destruction and became a shelter for some people who huddled in a basement as the fire came through. The Camp Fire is not over. Only 20 percent contained, it still threatens other communities, including the edges of Chico, the biggest city in Butte County and the evacuation destination for many Paradise residents, like Stewart. For James Betts, another Paradise resident, the miracle of escape has given way to the losses he knows he will face back home. Betts, a 33-year-old groundskeeper at a tree nursery, had tried to get out on foot on the morning of the fire. He does not own a car, and none of the seven people with him, including a nephew and his pregnant girlfriend, did either. A man in a pickup truck, known to none of them — Betts never even learned his name — pulled up and shouted for them to climb into the bed of the truck. And so they all made it. A spokesman for the Camp Fire command said that winds, which died down Saturday, were expected to pick back up Saturday night into Sunday. 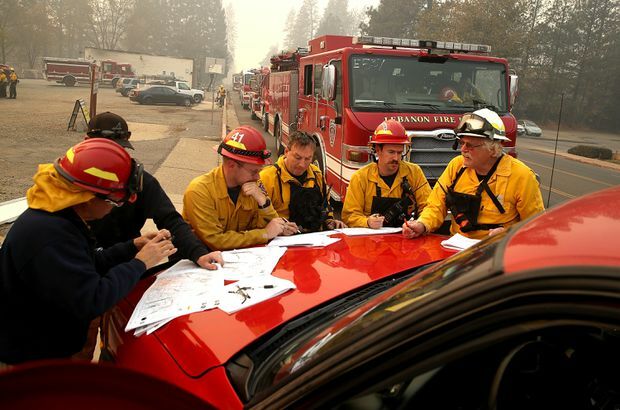 PARADISE, CA - NOVEMBER 10: Firefighters hold a morning meeting as they continue to battle the Camp Fire on November 10, 2018 in Paradise, California. President Donald Trump weighed in on the fires on Saturday, saying he would withhold federal funds from the state. The comments drew outrage from local leaders and firefighters’ organizations. Nearly 60 percent of California’s 33 million acres of forestland are owned by the federal government, according to a 2018 report by the California Legislative Analyst’s Office. 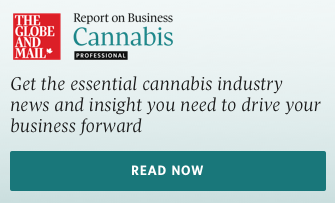 An additional 25 percent of the state’s forests are privately owned, and about 14 percent are owned by industrial owners like timber companies. State and local governments own just 3 percent of the state’s forests. One of two major fires in Southern California, called the Woolsey, has also surged, doubling in size overnight to 70,000 acres and forcing the evacuation of about 250,000 people, according to state officials. It was 0 percent contained as of Saturday morning. Fire crews in Ventura and Los Angeles counties were fighting on steep, hilly terrain that made controlling the blaze difficult. Osby said that winds were expected to pick up on Sunday and last through Tuesday, further complicating firefighting efforts in the region, and that they currently had no timeline for lifting evacuation orders or opening Highway 101, one of the region’s major thruways.